Flea Market - Their 52,000 square feet of vendor space and over 70 vendors are all connected under one roof and is heated and air-conditioned. You can sample and buy local meats, cheeses, fudge, candies, jams, jellies and more. Discover antiques, crafts, collectables, clothing, furniture, candles, quilts, and wood products. Lunch - Experience fine Amish cooking, family style. 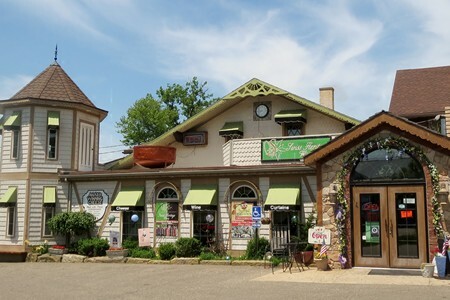 Then stroll through the shops and purchase some great Amish & specialty foods. Check out their heirloom quality furniture, home décor and gift items, customized floral arrangements, and more. The Broad Run Cheese House was established in 1933 by a group of local dairy farmers trying to get more money for their milk. Their efforts far surpassed their expectations. Through the years, Broad Run continued making some of the finest cheeses in America. Broad Run Swiss Cheese has earned countless awards for their exceptional quality. The latest award came in 2001 when Broad Run Swiss won the OHIO GRAND CHAMPION CHEESE in a yearlong competition. The Breiterbach Winery - In 1980 Breitenbach Wine Cellars was built by winemaker, owner Duke Bixler. 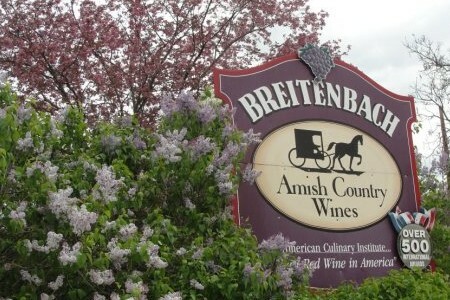 Initial production at Breitenbach was 1,500 gallons of grape and fruit wine. After several expansions Breitenbach now produces over 40 varieties of grape and fruit wines with an annual result of over 150,000 gallons. The gift shop also serves as a tasting room. The deli case features gourmet foods as well as locally made cheeses and smoked meats. Each year thousands of guests visit Breitenbach Wine Cellars making it “one of the most visited wineries in the country”.